In fact, following a successful 2018, Carvana is only projected for continual growth in the coming years. That’s why some in the industry argue that it’s getting harder for traditional dealerships to keep up with the fast-paced, internet-centric trend. Long story short, if Carvana isn’t on your radar, it should be. They’ve already established car vending machines in 9 U.S. markets, and with the addition of their online buying options, Carvana’s retail reach already covers over half of the U.S. population with plans to expand. 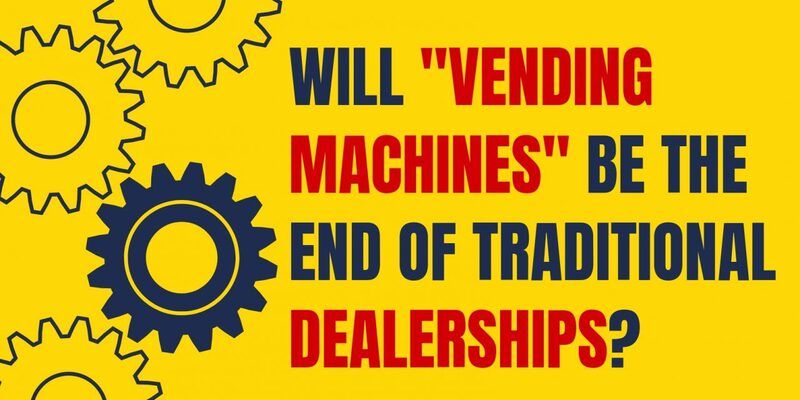 That’s bad news for traditional dealerships…or is it? Well, people love convenience. That’s why companies like Amazon and Uber have flourished. Customers crave the convenience of two-day shipping and Uber Eats. In addition to a car vending machine being exciting, the convenience factor alone is enough to attract some customers to these flashy new buying options and away from traditional dealerships. Despite the glamour of buying a car from a vending machine, not everybody wants or needs the experience these new technology-based options offers. See, there’s a specific shopper who buys a car from a vending machine—the type of person who comes to your dealership and knows exactly what they want before walking in the door. They’ve done the research; they’ve spent hours looking at cars online—14 or more according to some studies. Basically, they visit your lot to buy a car, below invoice, and get out. That leaves you with razor-thin margins that destroy your ability to provide exceptional service, solve problems, and truly help the customer. And here’s the thing: Not everybody wants to buy a car like that. So the answer is simple. If these technology-based options are selling to people who know exactly what they want, you need to target a different group of people. The truth is there’s an entirely untapped market full of people who want to dump their old ride and drive something else, but don’t even know where to start. See these convenience-driven start-ups are selling primarily to the Active Shoppers already in the marketplace. The 2% of the population who are actively looking for a new vehicle. This is the group that does all the research at home and comes to the dealership with their minds made up. And convenience-based car buying start-ups cash in on this 2% by cutting out the middleman—you and other traditional dealerships. That’s because, with lower overhead, they can afford to slash prices. But because most dealerships are going after the same 2% as all the convenience-based start-ups, it’s becoming increasingly difficult to compete in the crowded market. Luckily, a different group of customers is out there just waiting for you to sell them a car. These customers aren’t driven by price or vehicle type. They don’t already know what type of car they want to drive. Most of the time, they don’t even know they can drive a different car. In short, they’d never think about buying a car from a vending machine because they aren’t even shopping. But even if they’re not shopping, that doesn’t mean they aren’t dreaming of driving a different car. Because we know that no matter who you are, where you’re from or what you’re driving, if you could drive a nicer car than you do now for the same monthly payment, you would. But while everyone wants to upgrade their vehicle, not everyone thinks they can. That’s why people will continue to drive a car they hate, or one that is unsafe or doesn’t fit their situation. They’ll continue in a crappy situation simply because they feel trapped in it by either a real or perceived reason. There are a number of reasons people feel trapped in their old rides. Not having enough money for a large down payment, still owing a year or more on their current loan or even being turned down for a loan in the past are just a few reasons. On top of this, people also hate change. Even if it’s for the better, people won’t go out of their way to make change happen because it’s uncomfortable. People need help seeing that not only is their current vehicle situation upgradable, but the process can be enjoyable. Now, these technology-based automotive buying options would never appeal to these customers—they aren’t willing to put in the work to attract or even help them. They appeal to customers who already know they want to buy a car, have already done all they can to prepare for the purchase financially and have conducted hours of vehicle research. But YOU could appeal to these people and in doing so tap into a pool of prospects who are willing to buy from you and only you. By focusing instead on the people who are dreaming of driving a different car and showing them that you have a solution to the real or perceived problem that’s trapping them in their current ride, you will tap into an untouched market that we call the 98%. By providing these people solutions, you are not only avoiding direct competition with the new convenience-driven car-buying options, but you’re also avoiding direct competition with other dealerships in your area. You’ll become known as the only dealer in town willing to help the 98%. And even if you stop competing for the 2% and start attracting the 98%, you’ll still be equipped to help 100% of the people in your market. You’re just building yourself a system that gives you guaranteed cash flow and makes you immune to changes in the market—including but not limited to flashy car vending machines. By unlocking this untapped market, you’ll attract people who want to buy a car from you and only you. Want to learn more about how you can attract the 98%? Click Here to schedule a demo with one of our advisors to see how we can help you attract these customers today.